A killer whale responsible for the deaths of three people has resumed performing at SeaWorld. And park officials claim the animal "chose" to make his comeback. Last year, Tilikum the whale made headlines for grabbing his trainer by the ponytail and dragging her to a watery death. ABC recaps this and two other incidents: in 1991, a trainer fell into his tank, and he and two other whales kept her from getting back out, resulting in her death. And in 1999, a man broke into SeaWorld, stripped down to his underwear, and jumped into Tilikum's tank. His corpse was later "found naked and draped across the giant whale's body." 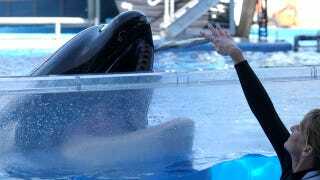 How Many Trainers Have To Die Before We Realize SeaWorld Is Awful? Despite these grisly deaths, Tilikum went back to work today — and what's more, SeaWorld claims he did so willingly. Park officials apparently told ABC that it was Tilikum's "choice" to perform, and that it does not "coerce" whales to do so. Which raises a whole host of questions, like: do whales just swim up to SeaWorld and beg to be included in routines? Do they give their verbal consent? Do they submit their resumes? Are they unionized? In all seriousness, the absurdity of SeaWorld's statement just underscores the upsetting nature of the whole whale-show enterprise, in which dangerous predators are captured and made to entertain people. The park says in a statement that performing "is an important component of his physical, social and mental enrichment" — but obviously killer whales in the wild somehow manage without putting on shows. They also have little occasion to encounter humans and kill them. Adding an even more disturbing note to ABC's story is the blase attitude one park visitor seems to have toward the risks of whale shows: "That's a chance that you take when you go and see an animal show whether it's whales, it's a lion, it's a snake, you take a chance seeing something horrible happen to a human being." Maybe if your show involves an inherent risk of one performer slaughtering another, you're doing something wrong. Earlier: How Many Trainers Have To Die Before We Realize SeaWorld Is Awful?